What to wear on gray, rainy days. 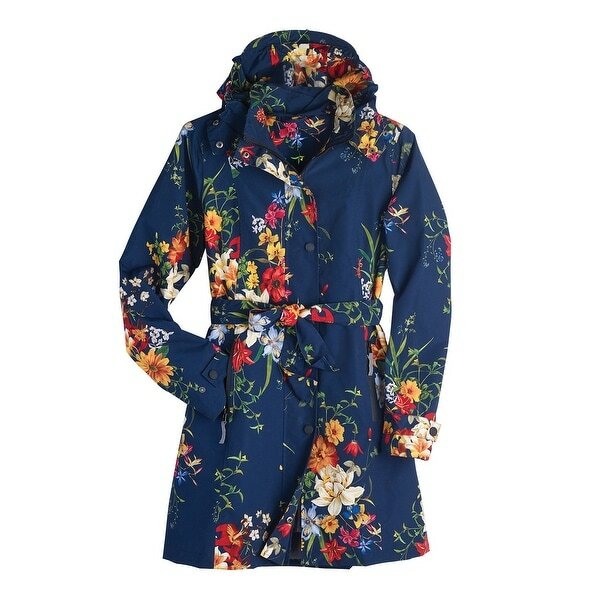 Bright flowers bloom everywhere on a classic navy raincoat. Made with care to keep you dry, it has waterproof taped seams, a zip front with snap placket, two front zip pockets and a 58" tie belt. Detachable hood with snap buttons. 100% polyester. Fully lined. Sizes 4-16. Size 8 hangs 34". Made in Canada. • FLORAL RAIN JACKET - Look stylish in the rain, or anytime, in this gorgeous lined jacket's floral print done on a rich navy blue background. • TIE BELT - Printed to match the coat, 58" tie belt gives it a classic trench coat shape. • DETACHABLE HOOD - Easily removable and re-attachable with snap buttons, roomy hood matches the coat's print. • ZIP FRONT WITH SNAP PLACKET - Zip it up to keep extra warm and/or use the snap buttons on the placket to quickly secure it. Waterproof taped seams. • TWO FRONT ZIP POCKETS - Large front pockets with zipper close keep your cell phone, wallet, and other possessions safe as you dance through the rain. I absolutely love this jacket. It is beautiful; colorful and of a very high quality.The fit is perfect and it is rain repellent. Not heavy and you can easily wear a sweater or sweatshirt underneath if desired. Omg I love my new rain coat it’s beautiful the material is great gorgeous it’s worth it the money. Just opened this delivery and am blown away by the quality of this coat. Could not be happier. Exceeded the description and the pictures. Overstock rocks! This product is everything I thought it would be, elegant and nicely priced. Won’t regret it if you buy it. I love the bright happy fabric,but I had to return it. It's too small.